On-the-spot relief for dry skin. This ultra-rich balm offers immediate and long-lasting relief for dry, flaky lips, cuticles, heels, and elbows. From first use the blend of emollients and nourishing, non-fragrant plant oils leave lips and skin feeling softer than ever before. Massage onto cuticles, elbows, knees, heels, lips—anywhere there is extremely dry or chapped skin. May be used as often as needed. This is a wonderful lip balm. The balm gets more softer when having used it for a while, at first it seems you don´t get enough moisture to your lips. Feels soft, moisturizing and not greasy or tacky. Doesn´t smell or taste like anything. I use this at night. At daytime I try to use something with SPF. Only minus is you have to stick your fingers in the jar. I think this one will last a long long time and can only imagine the bacteria increasing... I wish this lip balm works in the winter. I tend to have dry and cracked lips in wintertime. Customer Care: Thank you for your feedback. This kind of formula & texture is not so vulnerable as antioxidant-rich products, so don't worry about the stability! After reading the excellent reviews, I decided to purchase this lip balm but am not so happy with it. It doesn't moisturize my lips enough and leaves them ever drier afterwards. Also as I suffer from eczema, it has caused an allergic reaction and dry patches around my lips. Maybe this product contains parabens? I have contacted customer care to return this product but it is really inconvenient that Paula's Choice does not provide return labels nor refunds the return costs. First of all, this is a very good lip balm. For the first time in many years I don't suffer with dry lips. Sure there have been a few days, where I still ended up with dry lips, but those have been few and far between. This should say right on the product to apply a thick layer every night – it's really the best tip ever for treating dry lips! I'm sure this product could be improved upon though. The texture is great at sticking to your lips, but it can kind of “flake” when you dap your finger into the jar, if you don't smear the product around a bit to warm it up. Also you kind of have to break the surface of the product to get any on your finger. It's weird. I can see why they couldn't put it in a traditional lip balm tube. But overall the texture just doesn't really work well in a jar either. The finish is not too shiny which is good. Wish this had more moisture though my lips need it! This is too expensive to use for treating dry skin on the body and the few times I've tried it on smaller areas, it didn't seam optimal for it. So to conclude: The best lip balm I have ever tried, but it has an awkward texture and more moisture would be great. It must be possible to create a more moisturizing lip balm I'm sure. Looking forward to try the Lipscreen SPF 50 soon. Customer Care: Thank you for your feedback, please let us also know your opinion about the Lipscreen! This is the holy grail of lip balms, simply the best, bar none. Use this, and you will never have dry lips again. As a guy, I love that it has a very matte finish, and doesn't feel slick and greasy like almost every other balm I've tried. My complaints with it is that it unfortunately does not have an SPF, and it has an unpleasant smell. But those are minuscule problems in comparison to how good it actually is. I recommend it to everyone. - it's in a jar. It's really unhygienic sticking your fingers into the jar again and again. - it doesn't contain any spf. Still, it's a fantastic product that keeps my lips nice and moist! Wow, it is really the best lip care I've ever used. I got it about 2 weeks ago, since then I've been using it 2-4 times a day. For many years, at any time of a year, my lips were dry and chapped - I even was shy to kiss anyone - now I finally have silky, soft lips! It feels so great, thank you, Paula!! And I agree with other reviews, it would be nice to have this balm in a stick. As well as to have such saver with SPF. I absolutely LOVE this balm! I mainly use it for my lips and sometimes on my cuticles. Since I started using it a year ago my lips have never been dry or chapped again! I won't give it 5 stars because I would love it to be in a tube form. Isn't it less hygienic having the product in a jar where you have to dip your finger? Besides, I hate having a sticky finger after using it when I'm out and I can't clean my hands. I am very happy with the result! Instant moist, soft and pretty lips. I recommend it! charlotte - Great all-round product! Great product! I use it for lips and dry cuticles and it works really well. I had very high expectations of this product, there was no sample, so I had to buy the whole thing. I usually use 8 hour cream, which Paula only rates so so, but 8 hour cream has never given me allergy in the form of tiny red spots on my upper lip! I love many of your other products, but not this one. Customer Care: If a product is not to your satisfaction you are welcome to return it within 30 days for a refund. Please contact our customer servcie for instructions how to return the product. I absolutely love this product. I'm from Sweden, and as you may imagine with the unbeliveably cold winters we have here, my lips freak out! This gets rid of my chapped lips in an instant. I've tried the lip exfoliant as well, but I don't find it necessary to use. The lip balm does the job on it's own. Would really love if this came in a stick though. It's kind of a hassle to carry a jar around. I didn't notice you'd upped the size again - hooray! All is forgiven :-) Fantastic product (nothing gets rid of my kids' chapped lips quicker in winter) and restoring size / price ratio makes it a great buy! Barbara - Is this right? When I ordered this product recently it was only €7.95 - how can a price reduction bring it to €10? Am still smarting from the reduction in size of tub and increase in price before this! Customer Care reaction: The Lip Recovery Balm 6ml has recently been replaced by the Lip and Body Treatment Balm 15ml. The formulation has not been changed. Ricinus Communis (Castor) Seed Oil (non-fragrant oil/emollient), Petrolatum (emollient), Euphorbia Cerifera Cera (Candilla) Wax (emollient/texture-enhancing), Lanolin (emollient), C10-30 Cholesterol/Lanosterol Esters (emollient/skin replenishing), Cera Alba (Beeswax, texture-enhancing), Ozokerite (texture-enhancing), Ethylhexyl Palmitate (emollient), Copernicia Cerifera (Carnauba) Wax (emollient/texture-enhancing), Butyrospermum Parkii (Shea) Butter (emollient/antioxidant), Jojoba Esters (emollient), Triticum Vulgare (Wheat) Germ Oil (non-fragrant oil/emollient), Bisabolol (skin-soothing), Tetrahexyldecyl Ascorbate (vitamin C/antioxidant), Tocopheryl Acetate (vitamin E/antioxidant), Trihydroxystearin (emollient), Hydrogenated Polyisobutene (emollient/texture-enhancing). Which Lip Product is Right for Me? 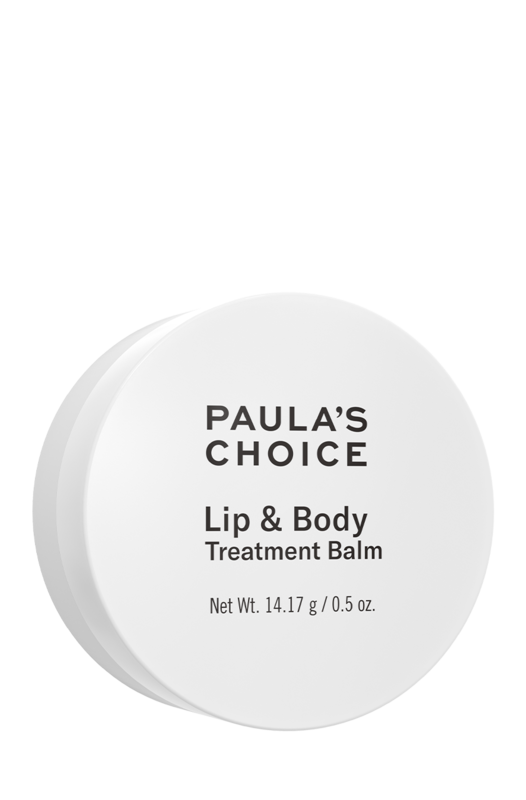 Paula's Choice offers different products for keeping lips in beautifully smooth, kissable condition. Sun protection is vital for healthy lips so there is a Lip Balm SPF 50 which is a rich, velvet balm to restore dry lips and a Lip Gloss SPF 40 with a sheer pink finish, a glossier option for keeping lips moist and shielded from the sun's rays. The Lip & Body Treatment Balm is best for nighttime lip care. This ultra-emollient product keeps lips smooth, soft, and protected from external causes of dryness such as indoor heat or low humidity. Lip & Body Balm may also be used as a moisturiser for cuticles, feet, hands—anywhere there is dry, rough, chapped skin. Lip & Body Treatment Balm may be used any time, but it should be followed with a product containing sunscreen if your lips or skin will see daylight.